Gujarat government’s attempt to “universalize” computerized bar-coded ration cards is starting to falter. A just-concluded workshop in Ahmedabad by the Anna Adhikar Surkasha Abhiyan, India’s premier right to food campaign body, has suggested that, despite loud claims about two years ago, people are resenting the new method because of its failure to provide any foolproof method to get subsidized food from ration shops in villages and towns. Grassroots activists complained of uncalled for delay in getting foodgrains because of lengthy procedures, poor working of computers scanning bar-codes on ration cards, and no alternative mechanism for migrants. 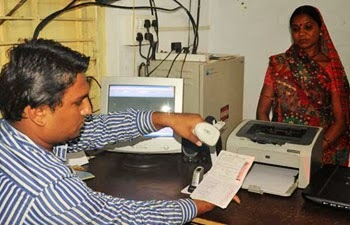 The system of going to the panchayat office to get bar-coded ration card scanned, and also determine the veracity of the ration card holder through a biometric machine, which in turn would print a slip telling the amount of foodgrains allowed, was found to be faulty. Grassroots activists complained, each time villagers had to go to the panchayat office, pay Rs 10 per slip generated from the computer, before going to the ration shop to get subsidized foodgrains. “It is a lengthy procedure. Often, it takes a full day, as there are long queues in panchayat office”, said Deshbhai from Surendranagar. Activists resented payment of Rs 10, which the computer operator charges as his fee, saying this should be abolished forthwith. When the computer operator goes on leave, people must come on another day for getting the printed slip. But the system of allowing just one person, generally head of family, to go to the panchayat office for thumb impression is worse. Earlier, anyone in family could go buy ration on showing the card. But now no more. Head of the family, whose biometric impression is registered, must visit the panchayat office for verification, get the slip, and then go to the ration shop. Kusumben, working for the NGO Anandi, complained that in Devgadh Baria of the predominantly tribal district, where she is placed, large number of families for days together is deprived of subsidized foodgrains. “Often, it takes three months for people to get another thumbs impression to be registered. Till then, the person concerned must depend on foodgrains at the market rate”, she said, adding, “Nearly 60-70 per cent of the Dahod able-bodied adults migrate to other districts. They are not given any roaming ration cards, they suffer badly as a result of the existing system”, she said. During the workshop, experts such as economist Prof Hemantkumar Shah and Mahendra Jethmalani, a budget analyst, said that there is an effort on the part of some powerful persons in the Government of India to undermine food subsidies under the new right to food law, passed in Parliament recently. “They calculate that it’s big drain on the budget. However, they do not explain why a much higher subsidy is provided to the corporate houses as tax and other concessions”, they pointed out. The example of Tatas having been given Rs 30,000 crore subsidy to put up Nano plant in Gujarat was cited. Gujarat government, while introducing the bar coded system of rationing, claimed two years ago that the new system had led them to cancel 18 per cent bogus below poverty line (BPL) families enrolled on registers having ration cards. There are in all 32.37 lakh BPL families in Gujarat. This, is was suggested, came to light when biometric impressions of each family began being taken for issuing new bar coded ration cards. However, activists contended the claim, pointing out, large number of BPL families was “left out” and were not issues bar coded ration cards. The workshop was held with the participation of 2,000 volunteers at Dalit Shakti Kendra, near Sanand, in Ahmedabad district.